Nevner det meste rundt behandling av muskel og skjelett problemer, både usikkerheter, manglende diagnostisk spesifisitet, dårlig forhold mellom forklaringsmodelle og realitet, og foreslår nevrosentriske forklaringsmodeller. Viser til at spesifikk behandling ikke har bedre effekt enn uspesifikk behandling. Og til at den mekaniske teknikken setter igang en kaskade av nevrologiske effekter som resulterer i en behandlingeffekt. Prior studies suggest manual therapy (MT) as effective in the treatment of musculoskeletal pain; however, the mechanisms through which MT exerts its effects are not established. In this paper we present a comprehensive model to direct future studies in MT. This model provides visualization of potential individual mechanisms of MT that the current literature suggests as pertinent and provides a framework for the consideration of the potential interaction between these individual mechanisms. Specifically, this model suggests that a mechanical force from MT initiates a cascade of neurophysiological responses from the peripheral and central nervous system which are then responsible for the clinical outcomes. This model provides clear direction so that future studies may provide appropriate methodology to account for multiple potential pertinent mechanisms. First, only transient biomechanical effects are supported by studies which quantify motion (Colloca et al., 2006;Gal et al., 1997;Coppieters & Butler, 2007;Coppieters & Alshami, 2007) but not a lasting positional change (Tullberg et al., 1998;Hsieh et al., 2002). Second, biomechanical assessment is not reliable. Palpation for position and movement faults has demonstrated poor reliability (Seffinger et al., 2004;Troyanovich et al., 1998) suggesting an inability to accurately determine a specific area requiring MT. Third, MT techniques lack precision as nerve biased techniques are not specific to a single nerve (Kleinrensink et al., 2000) and joint biased technique forces are dissipated over a large area (Herzog et al., 2001;Ross et al., 2004). Finally, studies have reported improvements in signs and symptoms away from the site of application such as treating cervical pain with MT directed to the thoracic spine (Cleland et al., 2005;Cleland et al., 2007) and lateral epicondylitis with MT directed to the cervical spine (Vicenzino et al., 1996). Subsequently, we suggest, that as illustrated by the model, a mechanical force is necessary to initiate a chain of neurophysiological responses which produce the outcomes associated with MT. Studies have measured associated responses of hypoalgesia and sympathetic activity following MT to suggest a mechanism of action mediated by the periaquaductal gray (Wright, 1995) and lessening of temporal summation following MT to suggest a mechanism mediated by the dorsal horn of the spinal cord (George et al., 2006) The model makes use of directly measurable associated responses to imply specific neurophysiological mechanisms when direct observations are not possible. The model categorizes neurophysiological mechanisms as those likely originating from a peripheral mechanism, spinal cord mechanisms, and/or supraspinal mechanisms. Musculoskeletal injuries induce an inflammatory response in the periphery which initiates the healing process and influences pain processing. Inflammatory mediators and peripheral nociceptors interact in response to injury and MT may directly affect this process. For example, (Teodorczyk-Injeyan et al., 2006) observed a significant reduction of blood and serum level cytokines in individuals receiving joint biased MT which was not observed in those receiving sham MT or in a control group. Additionally, changes of blood levels of β-endorphin, anandamide, N-palmitoylethanolamide, serotonin, (Degenhardt et al., 2007) and endogenous cannabinoids (McPartland et al., 2005) have been observed following MT. Finally, soft tissue biased MT has been shown to alter acute inflammation in response to exercise (Smith et al., 1994) and substance P levels in individuals with fibromyalgia (Field et al., 2002). Collectively, these studies suggest a potential mechanism of action of MT on musculoskeletal pain mediated by the peripheral nervous system for which mechanistic studies may wish to account. MT may exert an effect on the spinal cord. For example, MT has been suggested to act as a counter irritant to modulate pain (Boal & Gillette, 2004) and joint biased MT is speculated to “bombard the central nervous system with sensory input from the muscle proprioceptors (Pickar & Wheeler, 2001).”Subsequently, a spinal cord mediated mechanism of MT must be considered and is accounted for in the model. Direct evidence for such an effect comes from a study (Malisza et al., 2003b) in which joint biased MT was applied to the lower extremity of rats following capsaicin injection. A spinal cord response was quantified by functional MRI during light touch to the hind paw. A trend was noted towards decreased activation of the dorsal horn of the spinal cord following the MT. The model uses associated neuromuscular responses following MT to provide indirect evidence for a spinal cord mediated mechanism. For example, MT is associated with hypoalgesia (George et al., 2006;Mohammadian et al., 2004;Vicenzino et al., 2001), afferent discharge (Colloca et al., 2000;Colloca et al., 2003), motoneuron pool activity (Bulbulian et al., 2002;Dishman & Burke, 2003), and changes in muscle activity (Herzog et al., 1999;Symons et al., 2000) all of which may indirectly implicate a spinal cord mediated effect. Finally, the pain literature suggests the influence of specific supraspinal structures in response to pain. Structures such as the anterior cingular cortex (ACC), amygdala, periaqueductal gray (PAG), and rostral ventromedial medulla (RVM) are considered instrumental in the pain experience. (Peyron et al., 2000;Vogt et al., 1996;Derbyshire et al., 1997;Iadarola et al., 1998;Hsieh et al., 1995;Oshiro et al., 2007;Moulton et al., 2005;Staud et al., 2007;Bee & Dickenson, 2007;Guo et al., 2006). Subsequently, the model considers potential supraspinal mechanisms of MT. Direct support for a supraspinal mechanism of action of MT comes from (Malisza et al., 2003a) who applied joint biased MT to the lower extremity of rats following capsaicin injection. Functional MRI of the supraspinal region quantified the response of the hind paw to light touch following the injection. A trend was noted towards decreased activation of the supraspinal regions responsible for central pain processing. The model accounts for direct measures of supraspinal activity along with associated responses such as autonomic responses (Moulson & Watson, 2006;Sterling et al., 2001;Vicenzino et al., 1998) (Delaney et al., 2002;Zhang et al., 2006), and opiod responses (Vernon et al., 1986) (Kaada & Torsteinbo, 1989) to indirectly imply a supraspinal mechanism. Additionally, variables such as placebo, expectation, and psychosocial factors may be pertinent in the mechanisms of MT (Ernst, 2000;Kaptchuk, 2002). For example expectation for the effectiveness of MT is associated with functional outcomes (Kalauokalani et al., 2001) and a recent systematic review of the literature has noted that joint biased MT is associated with improved psychological outcomes (Williams et al., 2007). For this paper we categorize such factors as neurophysiological effects related to supraspinal descending inhibition due to associated changes in the opioid system (Sauro & Greenberg, 2005), dopamine production (Fuente-Fernandez et al., 2006), and central nervous system (Petrovic et al., 2002;Wager et al., 2004;Matre et al., 2006) which have been observed in studies unrelated to MT. Dette klippet nevner forskningen til den svenske nevrokirurgen Alfred Breig og viser til at det er hofteleddet som bestemmer det meste i nervesystemets tensjon (strekk). Utoverrotasjon og lett abduksjon gir minst strekk i nervesystemet. Magnesium gjør at nervesystemet blir mindre sensitivt i studie på rotter med nevropati. Dosen er beregnet til å være ca 147 mg pr dag (24t), som er veldig mye relativt til kroppsvekten på en mus på 10-20g. Om vi regner det om til menneskevekt blir det megadoser. Neuropathic pain is a common diabetic complication affecting 8–16% of diabetic patients. It is characterized by aberrant symptoms of spontaneous and stimulus-evoked pain including hyperalgesia and allodynia. Magnesium (Mg) deficiency has been proposed as a factor in the pathogenesis of diabetes-related complications, including neuropathy. In the central nervous system, Mg is also a voltage-dependant blocker of the N-methyl-d-aspartate receptor channels involved in abnormal processing of sensory information. We hypothesized that Mg deficiency might contribute to the development of neuropathic pain and the worsening of clinical and biological signs of diabetes and consequently, that Mg administration could prevent or improve its complications. We examined the effects of oral Mg supplementation (296 mg l−1 in drinking water for 3 weeks) on the development of neuropathic pain and on biological and clinical parameters of diabetes in streptozocin (STZ)-induced diabetic rats. STZ administration induced typical symptoms of type 1 diabetes. The diabetic rats also displayed mechanical hypersensitivity and tactile and thermal allodynia. The level of phosphorylated NMDA receptor NR1 subunit (pNR1) was higher in the spinal dorsal horn of diabetic hyperalgesic/allodynic rats. Magnesium supplementation failed to reduce hyperglycaemia, polyphagia and hypermagnesiuria, or to restore intracellular Mg levels and body growth, but increased insulinaemia and reduced polydipsia. Moreover, it abolished thermal and tactile allodynia, delayed the development of mechanical hypersensitivity, and prevented the increase in spinal cord dorsal horn pNR1. Thus, neuropathic pain symptoms can be attenuated by targeting the Mg-mediated blockade of NMDA receptors, offering new therapeutic opportunities for the management of chronic neuropathic pain. Diabetes is also the most common pathological state in which secondary magnesium (Mg) deficiency occurs. Indeed, Mg deficiency has been described in 25–30% and 13.5–47.7% of type 1 and type 2 diabetic patients, respectively (Garland, 1992; Tossielo, 1996; Corsonelloet al. 2000; Engelen et al. 2000; Rodriguez-Moran & Guerrero-Romero, 2003; Pham et al.2007) and its incidence is correlated to diabetes complications (De Leeuw, 2001). Mg is an ATPase allosteric effector involved in inositol transport (Grafton et al. 1992) and the impaired Na+/K+-ATPase activity in peripheral nerves of diabetic animals (Garland, 1992) plays a role in the pathophysiology of diabetic neuropathy (Li et al. 2005). In the central nervous system, Mg has voltage-dependent blocking properties that play an important role in pain processing at the N-methyl-d-aspartate (NMDA) receptor channel complex (Mayer et al. 1984; Xiao & Bennett, 1994; Begon et al. 2000). In vitro, this blockade operates at extracellular Mg concentrations of less than 1 mm (Mayer et al. 1984), i.e. within the ranges found in human and animal cerebrospinal fluid and plasma (Morris, 1992). The excess release of glutamate from central nociceptor terminals due to nerve damage releases Mg blockade and activates NMDA receptors known to trigger painful sensations (hyperalgesia, allodynia) and alter the sensitivity of postsynaptic cells, resulting in central sensitization (Bennett, 2000). This central sensitization involving the NMDA receptor can be induced in rats in vivo by Mg depletion (Alloui et al. 2003). Several studies suggest that phosphorylation of the NMDA receptor NR1 subunit is correlated to the presence of signs of neuropathy and to persistent pain following nerve injury (Gao et al.2005; Ultenius et al. 2006; Gao et al. 2007; Roh et al. 2008). Control non-diabetic group: rats given tap water. 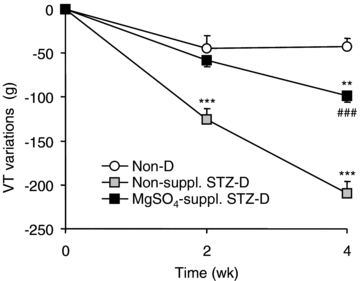 Water intake was 10-fold and sixfold higher in non-supplemented and MgSO4-supplemented STZ-D rats, respectively, compared with non-diabetic rats. 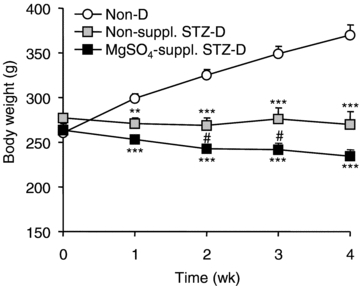 Water intake was significantly lower in MgSO4-supplemented STZ-D rats than non-supplemented STZ-D rats (Table 1). Consequently, urine excretion was 24-fold higher in non-supplemented STZ-D rats than non-diabetic rats. The MgSO4-supplemented STZ-D rats also developed polyuria corresponding to a 15-fold increase in urine excretion compared with non-diabetic rats, but which was nevertheless lower than the increase in non-supplemented STZ-D rats (Table 1). Polyuria in STZ-D rats was significantly correlated to water intake (P < 0.001). This study clearly showed that Mg supplementation prevents tactile and thermal allodynia and attenuates and delays mechanical hyperalgesia in STZ-D rats. This effect was mediated, at least in part, by the prevention of NMDA receptor NR1 subunit phosphorylation in STZ-D rats. However, the study also showed that Mg supplementation did not improve most of the biological and clinical signs of diabetes despite restoration of normal insulin secretion. En studie til fra Siegfried Mense, om muskelsmerter. Han har ikke fått med seg at trykksensitive nerver kun finnes i huden. Og han har misforstått litt i forskjellene mellom hud-smerter og muskel-smerter siden han sier at hud-smerter ikke kan ha utstrålende effekt. Han har tydeligvis ikke ikke inkludert subcutane nerver i sin vurdering. Men mye interessant i denne studien likevel. Spesielt vektleggingen av at lav pH er den viktigste bidragsyteren til muskelsmerter. Han nevner at input fra muskel-nociceptorer har større relevans i ryggmargen enn input fra huden. Derfor er betennelser og lav pH de viktigste drivkreftene i kroniske smerter. Nevner også at smerter henger sammen, f.eks. at trapezius kan stramme seg for å beskytte brachialis, slik at smerten kjennes i trapezius, mens problemet egentlig sitter i brachialis. Beskriver også triggerpunkter, men sier at det foreløpig er veldig mange ubesvarte spørsmål om denne teorien. Muscle pain is a major medical problem: in, the majority (60% to 85%) of the population has had (nonspecific) back pain of muscular origin at some time or other (lifetime prevalence) (1). 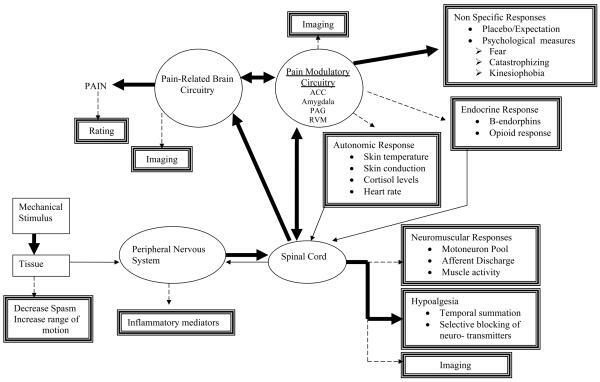 Pain evoked by myofascial trigger points has a point prevalence of approximately 30% (2). More than 7% of all women aged 70 to 80 years suffer from the fibromyalgia syndrome (e1). In an Italian study, musculoskeletal pain was found to be the most common reason that patients consulted a doctor (3). Thus, treating physicians should be aware of the mechanisms of muscle pain, insofar as they are currently understood. Muscle pain is produced by the activation of specific receptors (so-called nociceptors): these receptors are specialized for the detection of stimuli that are objectively capable of damaging tissue and that are subjectively perceived as painful. They consist of free nerve endings and are connected to the central nervous system (CNS) by way of unmyelinated (group IV) or thinly myelinated (group III) fibers. They can be sensitized and activated by strong mechanical stimuli, such as trauma or mechanical overloading, as well as by endogenous inflammatory mediators including bradykinin (BK), serotonin, and prostaglandin E2 (PGE2). Two activating chemical substances are particularly important for the generation of muscle pain: adenosine triphosphate (ATP) and protons (H+ ions). ATP activates muscle nociceptors mainly by binding to the P2X3 receptor molecule, H+ mainly by binding to the receptor molecules TRPV1 (transient receptor potential vanilloid 1) and ASICs (acid-sensing ion channels) (4). ATP is found in all cells of the body and is released whenever bodily tissues of any type are injured. A drop in pH is probably one of the main activators of peripheral nociceptors, as many painful disturbances of muscle are associated with low pH in muscle tissue. Nerve growth factor (NGF) also has a connection to muscle pain: NGF is synthesized in muscle and activates muscle nociceptors (e2). NGF synthesis is increased when a muscle is inflamed (e3). The neuropeptides stored in muscle nociceptors are released not only when peripheral stimuli activate the nerve endings, but also when spinal nerves are compressed. In this type of neuropathic pain, action potentials are generated at the site of compression and spread not only centripetally, i.e., toward the central nervous system, but also centrifugally, i.e., toward the nociceptive endings, where they induce the release of vasoactive neuropeptides. In this way, neurogenic inflammation comes about, characterized by hyperemia, edema, and the release of inflammatory mediators (8). The inflammatory mediators sensitize the muscle nociceptors and thereby increase neuropathic pain. The sensitization of the muscle nociceptors by endogenous mediators such as BK and PGE2 is one of the reasons why patients with muscle lesions suffer from tenderness to pressure on the muscle, and from pain on movement or exercise. It is also the reason why many types of muscle pain respond well to the administration of non-steroidal anti-inflammatory drugs (NSAID), which block prostaglandin synthesis. An influx of nervous impulses from muscle nociceptors into the spinal cord increases the excitability of posterior horn neurons to a greater extent than one from cutaneous nociceptors (9). A structural change of ion channels, rendering them more permeable to Na+ and Ca2+, is the short-term result of an influx of nociceptive impulses into the spinal cord. Among other effects, this causes originally ineffective («silent» or «dormant») synapses to become effective. A change of gene transcription in the neuronal nucleus, leading to a modification of synthetic processes, causes new ion channels to be synthesized and incorporated into the nerve cell membrane. The long-term result of central sensitization is a nociceptive cell whose membrane contains a higher density of ion channels that are also more permeable to ions. This explains the hyperexcitability of the cell. Glial cells, too, particularly microglia, can contribute to the sensitization of central neurons by secreting substances such as tumor necrosis factor a (TNF-a) (8). The increased excitability of spinal neurons and the spread of excitation within the CNS are the first steps in the process of chronification of muscle pain. The endpoint of chronification consists of structural remodeling processes in the CNS that open up new pathways for nociceptive information and cause pain to persist over the long term. Patients with chronic muscle pain are difficult to treat, because the functional and structural changes in the CNS need time to regress. The fact that not all muscle pain becomes chronic implies that chronification requires not only the mechanisms just discussed, but also other ones, e.g., a genetic predisposition. Pain arising in muscle is more likely to be referred pain than pain arising in the skin. Referred pain is pain that is felt not (only) at its site of origin, but at another site some distance away. A possible mechanism of referred pain is the spread, within the spinal cord, of excitation due to the muscle lesion (9) (figures 2 and ​and3).3). As soon as the excitation reaches sensory posterior horn neurons that innervate an area beyond the site of the original muscle lesion, the patient feels referred pain in that area, even though none of the nociceptors in it are activated (13). 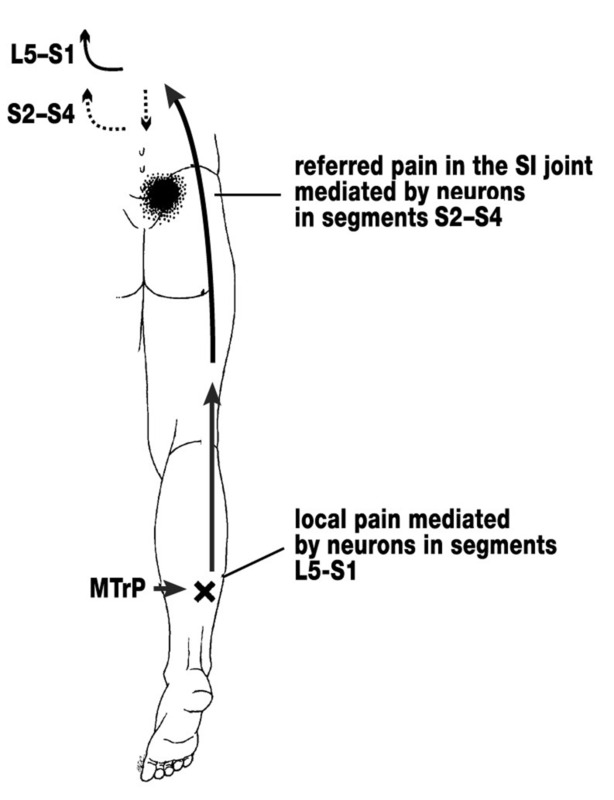 An example is shown in figure 3: a stimulus delivered to the myofascial trigger point (MTrP) in the soleus muscle causes only mild local pain, while the patient feels more severe (referred) pain in the sacroiliac joint. No conclusive answers are yet available to the questions of why muscle pain is more likely than cutaneous pain to be referred, why it is usually not referred to both proximal and distal sites, and why pain referral is often discontinuous. There is, however, a well-known discontinuity of spinal topography between the C4 and T2 dermatomes. The main reason why pain arises in muscle spasm is muscle ischemia, which leads to a drop in pH and the release of pain-producing substances such as bradykinin, ATP, and H+. The vicious-circle concept of muscle spasm – muscle pain causes spasm, which causes more pain, etc. – should now be considered obsolete. Most studies have shown that muscle pain lowers the excitability of the α-motor neurons innervating the painful muscle (14) (a «pain adaptation» model) (15). Muscle spasm can be precipitated by, among other things, pain in another muscle. Thus, a spasm-like increase EMG activity in the trapezius muscle has been described in response to painful stimulation of the biceps brachii muscle (16). Another source of muscle spasms is pathological changes in a neighboring joint. These sources of pain must be deliberately sought. In a widespread hypothesis on the origin of MTrP’s (19), it is supposed that a muscular lesion damages the neuromuscular endplate so that it secretes an excessive amount of acetylcholine. The ensuing depolarization of the muscle cell membrane produces a contraction knot that compresses the neighboring capillaries, causing local ischemia. Ischemia, in turn, leads to the release of substances into the tissue that sensitize nociceptors, accounting for the tenderness of MTrP’s to pressure. Substances of this type have been found to be present within the MTrP’s of these patients (20). This supposed mechanism leaves many questions unanswered but is currently the only comprehensive hypothesis on the origin of MTrP’s. and referred pain outside the MTrP (figure 3). Because the MTrP is cut off from its blood supply by compression of the local microcirculation, oral NSAID’s are not very effective against TrP pain. Muskelspenninger helt øverst i nakken bidrar til mange problemer. F.eks. hodepine, spenningsmigrene, kjevespenning, nakkeplager, bevegelsessmerter i nakken, dårlig søvn, m.m.. Spesielt smerter i panna og tinningene har ofte utgangspunkt i området øverst i nakken. På Verkstedet har vi nå en ny behandlingsform som løser opp dette problemområdet på en svært behagelig og overraskende effektiv måte, og med en eksepsjonelt elegant forklaringsmodell som er på vei til å revolusjonere forståelsen av smertebehandling verden over. I området som kalles Occiput helt øverst i nakken har vi mange muskler som styrer hodets balanse i alle vinkler. Muskel- og leddterapeuter(fysio, kiro, osteo, massører, osv) tenker vanligvis at det er muskelspenningene som er problemet og at det gjør vondt fordi musklene er stive og inneholder triggerpunkter, eller fordi et ledd er låst. Men med denne nye behandlingsformen innser vi at det er nervesystemet som har problemer, ikke musklene eller leddene. Musklene og leddene gjør bare det nervesystemet befaler. Og det er nervesystemet helt ytterst i huden som reagerer på trykk, IKKE muskelene eller bindevevet. Når vi trykker på en muskel eller et triggerpunkt så er det altså ikke trykket på muskelen du kjenner, men trykket på nervene helt ytterst i huden. Når vi endelig innser at det er de sensoriske nervene rett under huden som reagerer på trykk og opplevelsen av smerte eller stråling ut panna og tinningene, så kan vi også behandle disse direkte. I konvensjonell medisin har man skjønt at det er nervetrådene som har problemer. Når det har blitt et seriøst problem kaller de det Trigeminusnevralgi eller Occipetal Nevralgi. Men her behandles disse nervene med f.eks. nedfrysing, bedøvelse, Botox eller avbrenning. I forhold til den nye behandlingformen vi har tatt inn på Verkstedet er dette unødvendig smertefulle og inngripende behandlingsmodeller. Og det værste av alt, de er dyre og har ikke spesielt god effekt heller. Med vår nye behandlingsmetode får du en umiddelbar release av muskelspenninger og smerte øverst i nakken. Ikke fordi vi masserer hardt, bedøver eller brenner av nerver, men fordi vi gir huden en behaglig og mild strekk som åpner opp for de minste nervetrådene i huden. De får mer blodsirkulasjon, mer plass, mer næring, og en behagelig stimuli som demper smerte i løpet av noen få minutter. I forskning regner man at en smertereduksjon på 2 poeng i en 10-poeng skala er «statistisk signifikant». Klienter rappoerterer en umiddelbar reduksjon på 6-8 poeng med denne behandlingsformen. Det er ganske radikalt. Og det er svært overraskende at noe så enkelt og noe så behagelig kan gi en så stor endring i smerteopplevelsen. Selv de som er vandt til behandling hvor «vondt skal vondt fordrive» lar seg overraske av effekten i dette behandlingskonseptet. Behandlingsformen kalles DermoNeuroModulation. Legg merke til dette navnet. Dette er begynnelsen på en revolusjon i behandling av smertetilstander. Dermo betyr huden, Neuro betyr nerver, Modulation betyr å endre. Altså, vi endrer nervesystemets respons med behandling av hudens nerver. Varigheten av forbedringen er avhengig av mange faktorer, bla. ernæring, trening, stressreduksjon og alvorlighetsgraden man kommer med i utgangspunktet. For de fleste gir det en radikal bedring allerede etter første gang, og vanligvis trenger man 2-4 ganger for å få de mest solide resultatene. Noen trenger mer, noen trenger mindre, men ALLE blir overrasket over effekten.